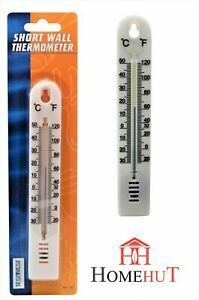 Keep track of the weather or make sure delicate garden plants are safe by placing this West Short Wall thermometer in your garden. It features a simple and easy to read analogue display. The traditional layout lets you see at a glance the current temperature in Celsius or Fahrenheit. The thermometer is lightweight and compact, and there's a ready-cut hole at the top for easy hanging using any standard-sized nail. Immediate payment of GBP 1.39 is required.